Ladakh's trekking opportunities can extend year-round, and here are accounts of the Sham Trek, Chadar Trek and Markha valley trek and a new winter trekking route via a frozen river between Zanskar and Central Ladakh. Cicerone author and trek leader Radek Kucharski shares the challenges and thrills of his first and second winter seasons. My hunger for trekking in Ladakh grows with every visit – anticipating new routes and new seasons as well as returning to familiar faces and places. 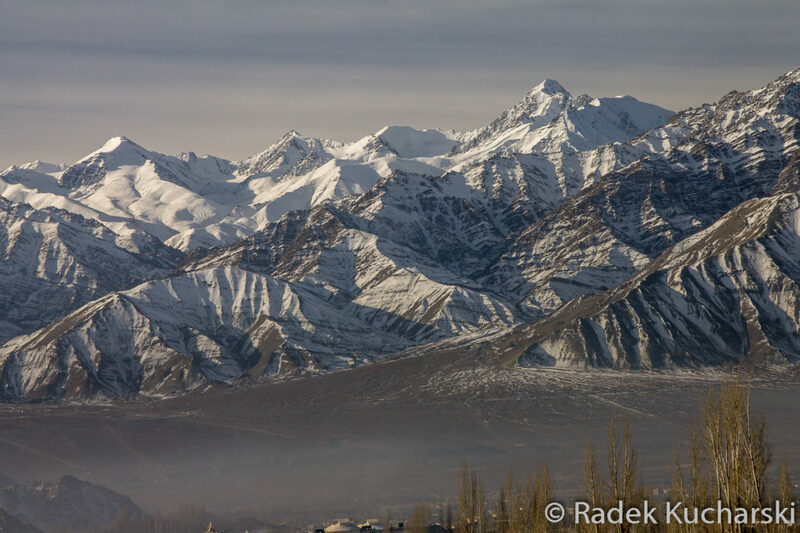 A year ago, in the year of my tenth anniversary of the first visit, I had my first taste of Ladakh in winter. 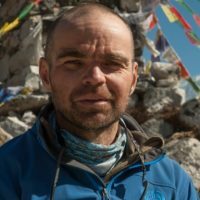 A year on, with those first winter treks behind me, I returned, with more courage and bigger plans. 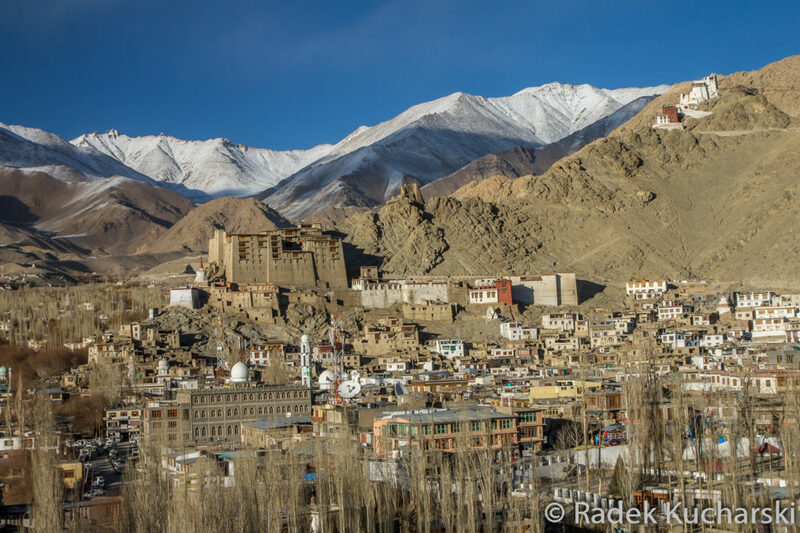 And now when I think about the next winter I can hardly think about anything other than Ladakh! Leaving for Ladakh in January 2014 I had heard about the Chadar Trek – the frozen Zanskar river trek – but, firstly, I wanted to trek independently and I believed that that route would be difficult and dangerous without a guide. 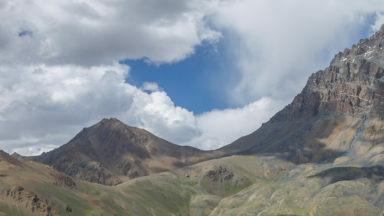 Secondly, I wanted a broader view of how Ladakh was in winter in general and whether there were other treks to be done. I decided for the village-to-village mode of trekking – no tent, no cooking stove, no food to be carried. That would also avoid having to tackle any high passes which I expected to be snowy, cold and difficult for a trekker on their own. I did the Sham Trek, a very popular trek in the summer months and also called a 'baby trek' sometimes, as it is short and easy with many villages on the way. It’s not one I would even consider in summer, as much of the trail follows roads (albeit quiet ones), but it seemed to be a good choice for a first winter in Ladakh. I had a highly enjoyable five or six days with lovely views, no other tourists and many interesting encounters with local people. A short hike between Tar and Mangyu villages over Hibti and Mangyu passes followed. That was the hardest thing I'd ever done. Cold, windy weather and steep although not very high passes really tested me and showed me that trekking in winter here is much more demanding than in other seasons. 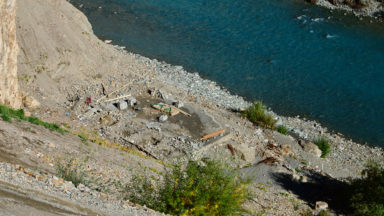 My third and final trek of that first visit was the Markha valley trek – up to the last village and down to the trolley crossing near to the confluence of Markha and Zanskar rivers, over about ten days. I met no other tourists all the way, but quite a few locals travelling up or down the valley and a couple of shepherds walking with their flocks. There were some bharals and birds as well as snow leopard footprints in snowy places – lots of them! – and everywhere winter silence, wilderness, serene mountains and gorgeous views. 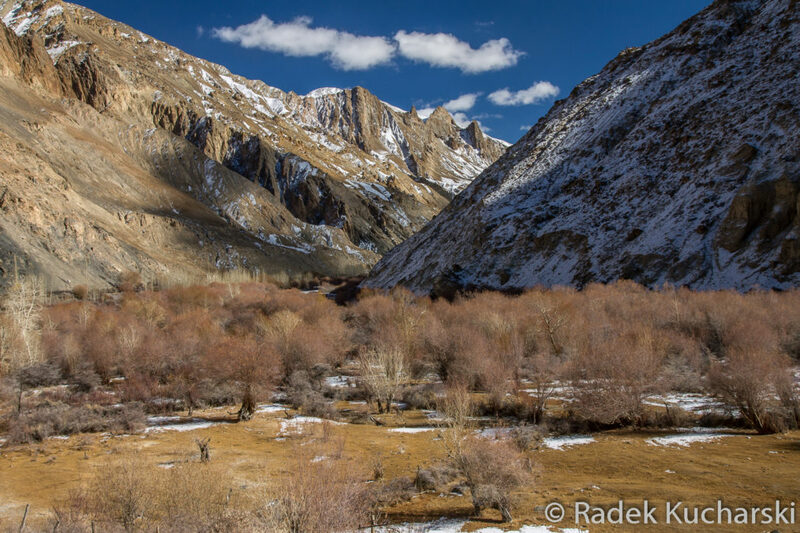 After a month I was convinced that there was more about Ladakh in winter than the famous Chadar Trek alone. I knew I would come back. I was back in Leh, less than a year later, in mid-December 2014, this time with cooking equipment, a sleeping bag suitable for -20°C and a good 4-season mat. I consulted my Zanskari friends before the trip. 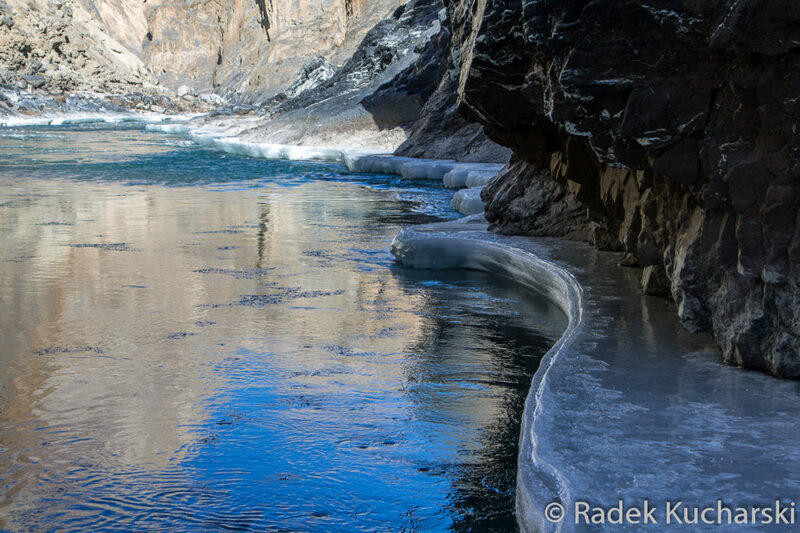 The ice on the Zanskar river is usually good enough to walk on between the beginning of January and late February. That is the season for winter commercial treks so some Zanskaris leave their homes in the beginning of January and walk to Leh by Chadar to work as tourist guides, cooks, porters and helpers. Before that, until heavy snowfalls, some locals use routes over the passes to communicate between Zanskar and Central Ladakh. My plan was to check this route. I started in Lamayuru on the classic trekking route between that village and Padum in Zanskar: the Lamayuru-Padum/Padum-Lamayuru trek. There was hardly any snow as far as Photoksar and an inch or two beyond that. Still, the first of the major passes looked serious in the cloudy weather and poor visibility. 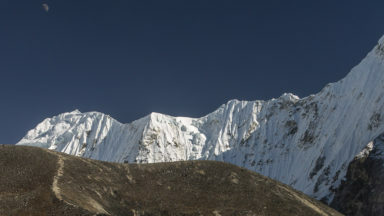 The two major passes on my route – Sengge La and Hanamul La (Hanuma La) – worried me from the beginning. Both are well over 4500m high and it had been difficult to cross much lower passes than these the previous winter. In addition, Hanamul La is very steep from the side I was approaching it from. And to do it you have to camp – the villages are too far away. 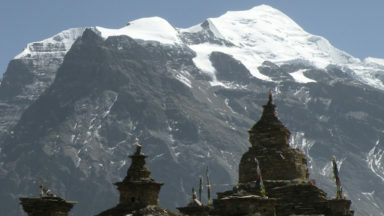 There is a shelter at about 4300m on the way between the Photoksar village and Sengge La. It's a solid building made of stones with a roof and door. However, the door is usually open so the shelter is often used by... yaks. Not surprisingly then, the floor was full of dung when I arrived. Dry dung, luckily. In the morning it was cloudy, with a bit of fresh snow and the pass hardly visible: not a perfect day for hiking. It was the Ladakhi Losar (New Year’s Day). I followed the road that is under construction on this section of the route – less steep but a longer way up. I got to the top (about 4954m) at noon. It was windy and cold. I happily sheltered in quite an ugly building housing two big prayer wheels. Lunch was a few sips of hot water from my vacuum flask and a chocolate bar. It was a long way down. Not to lose the way in the cloudy, foggy and slightly snowy weather I stuck to the road as far as its end at the Kyukpa pass. Prints of the last car wheels which must have passed this way a few days earlier were still visible but there was too much snow to allow any other car to get through before the spring. Finally I got to Sonam Dawa's house in the Gongma village just before dusk. There I took two days rest for the Losar celebration in the Gongma village and then crossed to Lingshed. An unsuccessful attempt on the Hanamul La (about 4757m) followed. Starting the approach in Lingshed, a long way from the beginning of the climb to the pass (in summer trekkers can break the journey at a campsite at about 4040m but there is no winter shelter) I found myself exhausted in loose snow over a foot deep, almost 6 hours after leaving the village. I was only about 150m below the pass on the steep final ascent but I decided to retreat. It was not an easy choice and not an easy thing to do with the long distance and the minor pass (4230m) on the way back to Lingshed. I reached the village at dusk again. A few days passed again. Losar celebration came to the end and I found a man ready to guide me to Zanskar by the frozen Zanskar river route. We left at 7am on the very first day of 2015! 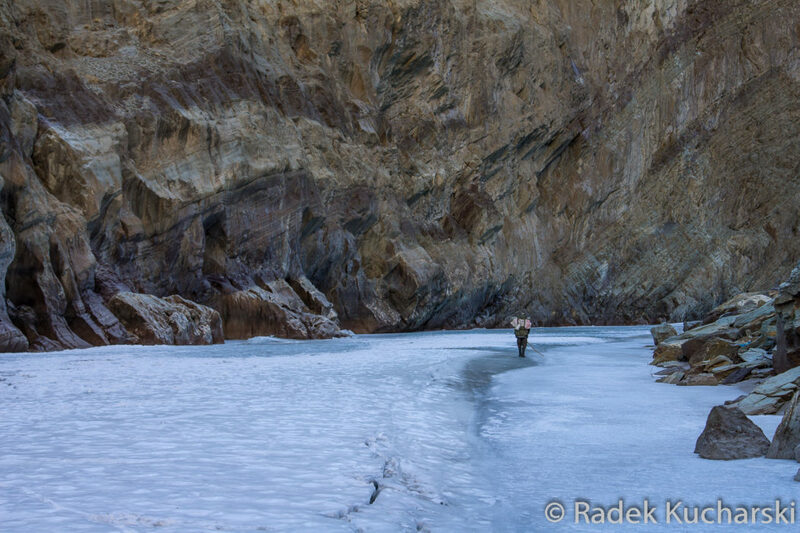 An easy walk down the valley brought us to the solid ice on the Zanskar for my first taste of the Chadar. Lobsang, my guide, returned as soon as we reached the road-head which extends along the valley from Zanskar towards Central Ladakh. There was supposed to be a car waiting for me a half-hour walk ahead but it had left before I reached it. It was a long day again and almost dark when I reached Dorjee's house in the Hanamur village on the evening of 1 January! A beautiful sunny day dawned next day for the scenic walk between Hanamur and Pishu, followed by a cloudy one as I finally completed the trek and reached Padum. Two or three tranquil days followed spent staying at Jimmy's house for family get-togethers and parties with plenty of good food and a bit too much chang (a local alcohol made of barley). Then we got a message from people of the Raru village. That was the group of guides, porters and cooks which was going to Leh to work with tourists. They would come to Padum on the next day and would leave for Leh by Chadar on the following night. I had to get ready to join them. The thing that worried me most was the pace of their walk. 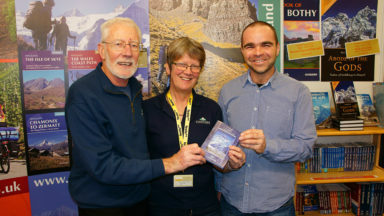 I knew some of them and I knew they had done long stretches of the route in one day the previous year which normally take 4 to 5 days for a tourist group. I was afraid they would want to do it again. We left at 3 or 4am in two cars and reached the road-head at dawn, starting with our head torches on. We were more than 20 people, each with their luggage on a sled, most wearing a pair of simple foamed neoprene rainboots – mine a bit too tight. It’s warm as long as you keep walking but cold when you stop for a while as your feet are thoroughly sweaty; good on the ice and in shallow waters, quite unreliable on slopes and rocks in places where the river is not frozen and you need to find an alternative way. In some places where the ice was good we ran. Not needing to take smoking breaks like some of the others, I managed to avoid being last! 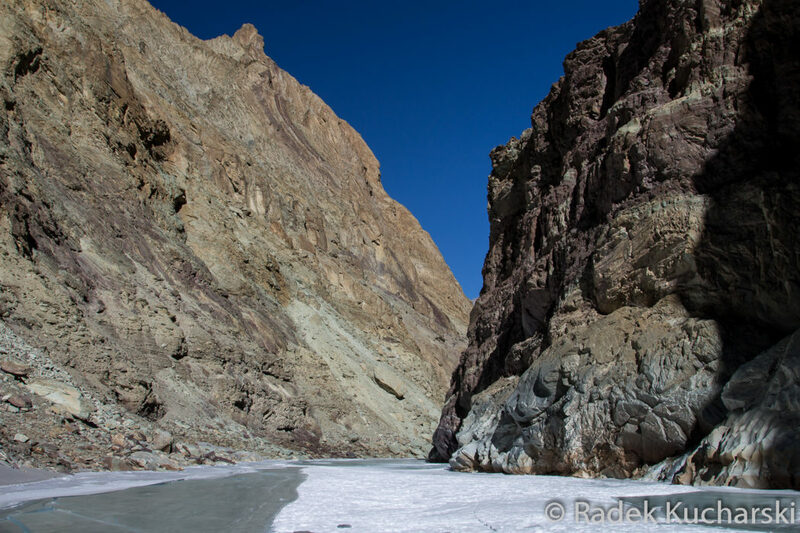 Chadar is definitely physically easier than other winter treks I have done in Ladakh but it could be a big psychological test – walks on narrow ice next to deep, fast-flowing waters, with steep slopes as well as water crossings. It took one and a half days for our team to reach the road on the Leh side of the valley with one night spent in the open, under an overhanging rock face. I didn’t feel I had fully tasted the delights of the Chadar. Back in Leh with still some time before my flight to Delhi I left for another short trek. 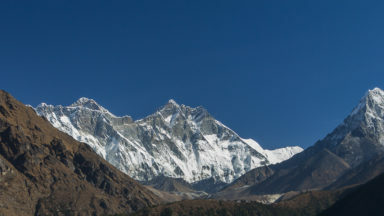 Ganda La (or Kanda La, about 4973m), which I hadn't dared to consider the previous year was now on my mind. It turned out, however, to be fairly easy now that I had acclimatised and there was hardly any snow on the trail. It was a good hike with fantastic views, some wildlife encounters and pleasant time spent with the Ladakhis on overnight stays in family-run homestays or simple guesthouses. And then, to top it all, I had a fantastic flight over the Himalayas to enjoy as I left, flying towards Srinagar for the first time for me. We had views of the confluence of the Indus and Zanskar rivers, the moonland of Lamayuru, Nun & Kun – the over 7000m high peaks of the Great Himalaya Range, the Suru Valley and countless mountains. My hunger for trekking in Ladakh will never be satisfied. And there is so much more to enjoy there in the winter than the Chadar.